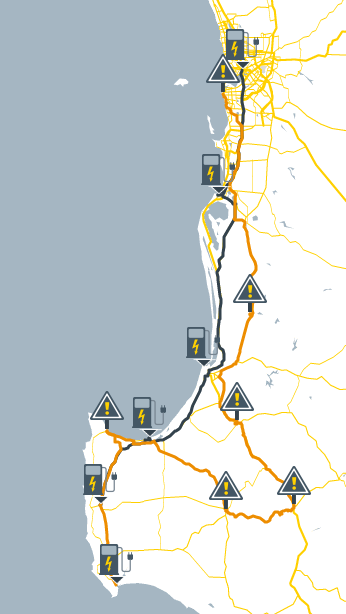 The charging stations enable electric vehicle owners to travel anywhere between Perth and Augusta along the coast. The stations are equipped with 3 types of connectors: 1 DC CSS Combo 1 mode cable/connecto, 1 DC CHAdeMO mode 4 JEVS G105 cable connector and 1 AC Mode3 Type 2 (Mennekes) cable connector for the Tesla Model S.
This system allows charging for almost any electric vehicle model. To get access to the charging stations, you will need a RFID card (existing RFID will work), which will activate the chargers. RAC waives the cost of a charge until 31 December 2015, charges will apply starting in 2016. The project is the result of a collaboration between RAC and the local government and the stations remain publicly owned.